Itemis-glen-cartoon-m-8787-386 - "I'm sorry, Mr.Secretary, but your record has been broken by some obscure politician in the Canadian government"
Itemis-glen-3020 - "It's with a great deal of pride that we present to you this great city's symbol of friendship." 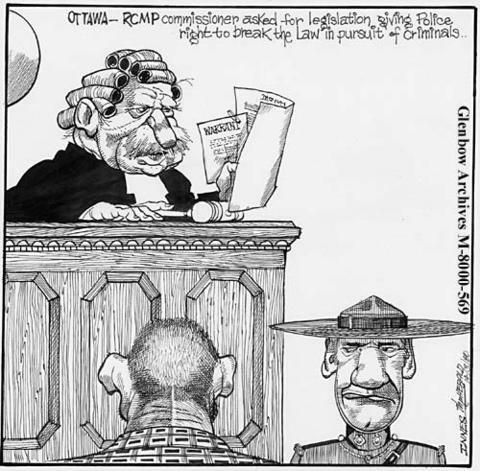 Itemis-glen-cartoon-m-8787-387 - "Keep it well fed and it won't give you any problems"
Itemis-glen-3021 - " ... driving over the speed limit, breaking and entering, double-parking, postal code violations, etc. etc. ... Now, what are the charges against the prisoner?" Itemis-glen-3022 - "Tightening the old purse strings." Item is-glen-3021 - " ... driving over the speed limit, breaking and entering, double-parking, postal code violations, etc. etc. ... Now, what are the charges against the prisoner?"